Summary: In this article I will discuss the concept of doing the little things, also known as the “Slight Edge,” to reach your goals. I will provide examples from working with Division I athletes in the Strength and Conditioning setting that are applicable to anyone trying to achieve their health and fitness goals. I’ll also present a frame work for change that has been shown to work in numerous settings as presented by Alan Deutchman in his book Change or Die. Achieving success in your health and fitness goals can be a daunting task. 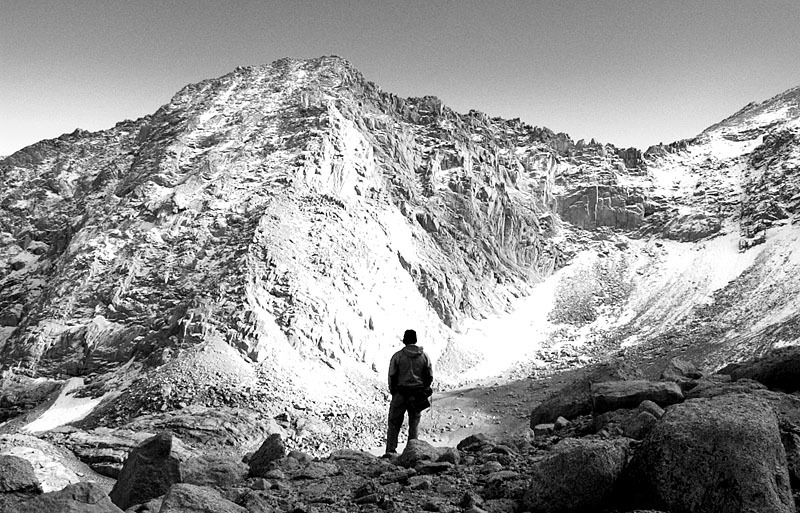 It is very much like looking up at the top of a mountain and thinking to yourself, “how am I ever going to get up there?” In reality after a few hours of putting one foot in front of the other, you reach to top of the mountain. At that moment, it’s hard to believe that only a few hours earlier you were at the base of the mountain looking up. The view from the top is spectacular. Getting to the top wasn’t easy, but each individual step really wasn’t that difficult. The hardest part was continuing to make each additional step. There is a philosophy in business known as the “The Slight Edge” that applies to both the above analogy and to just about any goal in life (Olson, J. 2011). The author, Jeff Olson presents the philosophy in detail in his book “The Slight Edge: Turning Simple Disciplines into Massive Success.” The philosophy describes the idea of being willing to do the little things day in and day out that add up toward reaching a goal. None of these little things are that hard, similar to taking one more step up the mountain. The real challenge is doing these tasks over and over. As Olson puts it “easy to do… [and] easy not to do” (Olson, J., p. 35, 2011). The graphic below from Olson’s book illustrates his philosophy (p.12, 2011). So what are these little things Olson’s talking about? Well, it depends on the goal you are trying to achieve. Knowing the above concept is critical to the how you approach achieving your goal. However, it’s also important to know what needs to be done to reach your goal. The first step is to determine what your specific goal is and which of your current actions support that goal and which of your actions are keeping you from reaching that goal. Depending on your goal you may have to learn more to know what actions will support it. Let’s say feeling better about how you look in your clothes is your goal. You know that this requires eating healthy and living an active life style. These are very general ideas and you may need to learn more to understand them better. This doesn’t mean you have to wait to start. You probably already know the basics of what you need to do. Eating more vegetables and less processed food as well as being active at least 30 minutes most days is probably a great place to start. The little choices in this scenario may be choosing a side salad over chips or talking a walk instead of watching a TV show. Some less obvious habits that can support this goal are never taking the elevator or always parking at the back of the parking lot at the grocery store. Both take almost no additional time, if any, and allow you to live little more physically active life. These are only a couple examples of the many choices that you can make throughout your day that will either add up to reaching your goals or will add up in preventing you from reaching your goals. A question you can ask yourself: “Is this action helping me reach my goal or is it taking me away from it?” It’s important that I point out that perfection is not the answer either. 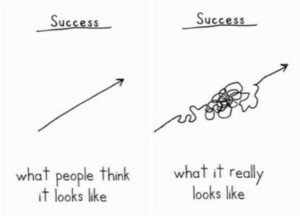 That’s not how real life or success works. The image below by Demetri Martin, author of “This is a Book,” does a great job of illustrating this (Blodget, 2012, April 14). The point is that the majority of your actions need to lead in the general direction of your goal. To provide a more detailed example of the little things that are important, let’s look at the world of college athletics and more specifically the physical training that goes on behind the scenes. Working as a Strength and Conditioning Coach at a Division I, Power 5 University I apply the philosophy of the Slight Edge on a daily basis. It is a part of every training session with the teams I have the pleasure of coaching. The goal of each strength and conditioning session is to prepare the athletes to compete and be successful in their sport. Within each session there are a lot of little factors that add up to a successful or unsuccessful training session. While part of my role is to teach and hold athletes accountable to a high standard, ultimately they are the ones who must put in the work and do the little things to be successful. This begins with being on time and in proper attire. Starting off without either of these is already working against the athlete’s success. For those who don’t think being on time is that big of a deal, consider that if you are late to a competition there is a good chance the athlete or team will not be able to compete at all. Other factors that are critical from the beginning are having a positive attitude, being mentally ready to train, and showing respect toward others. All three of these add to an athlete’s ability to get the most out of the training session and add to their teammate’s workout. Starting each training session with a quality warm up is critical. Each athlete must be intentional about doing this well, along with all other parts of the training session. Failing to do so and only going through the motions is one more factor working against rather than toward success. Similarly within the workout each exercise or drill must be executed with purpose. This may be different for each individual. One athlete may focus on technique, one on effort, while another focuses on speed of the movement. Whether it is a team sport such as Basketball or an individual sport such as Track & Field some level of awareness and engagement with teammates is also critical. While a teammate is performing a lift or drill the athlete resting can be watching, learning, encouraging, or providing feedback. This in turn helps them while they are performing the exercise. Instead of letting their mind wander, this increased level of engagement on each rep, while they are waiting adds just a little bit more toward their success. While it can be challenging at first, learning to hold a teammate accountable to their best effort and being held to the same standard adds even further toward success. Zooming out a little bit, having awareness of what’s coming next and being efficient both in the current exercise and in setting up for the next activity allow for more quality work to be done in a given time period. This can mean staying on pace to finish an exercise on time or setting up for the next exercise during the rest time. Due to tight schedules, recovery is often left to the athletes after the training session. While this can provide a lot of freedom of choice it also means that stretching, foam rolling, ice baths, or other recovery modalities are not required. Making a commitment to recovery after every training session is another factor that adds to success that is easy to do, but is also easy to skip. All of the above assumes that everything is going right. What if an athlete is injured? When this happens, it provides a bit more of a challenge like many things that may come up in life that adds an obstacle to achieving your goals. The key that we teach athletes is to stay on top of rehab and to come to every training session. Within the training session the workout is modified so that the athlete can train near their teammates and do as much as they are able. Often times there is still a lot that can be accomplished with some minor changes that either allows an athlete to maintain their current level of physical ability or continue to progress in others while the injury heals. The point is that no matter what challenge life throws your way, there are small choices and actions you can make to keep moving in the direction of your goals. In the athletics example there are a lot of small details described to illustrate how even the littlest things can add up toward success. All of this may seem a little daunting and discouraging when it comes to applying it in your own life. Often times though the hardest part is just taking the first step and making a commitment to yourself to go after your goals. Too often people say they will start tomorrow or some future date and never do. Take one small step now toward your goal. You don’t have to, nor should you try to change all the small things at once. Rather just start with one and then add another. It won’t happen overnight but each step you make will take you just a little bit closer. A final framework that may be helpful along your path is Alan Deutchman’s keys to how people really change their behaviors; “relate, repeat, and reform” (2008). In his model, first you’ve got to find an environment or relationship with a mentor that you can relate with and that will support reaching your goal. It’s also important to find a community of support and accountability, whether it is family, friends or others that have the same goal. This will allow you to repeat the new actions necessary to reach your goals frequently enough that they become habits, hence the second part of the frame work of “repeat.” Once this becomes your new normal, your view of the world related to your goals will have changed along with your habits and behaviors. This is the reframing of the Deutchman’s model that allows for the change to be both accomplished and aid in sustaining it. This model adds the components of environment, a mentor, finding support, and accountability to “The Slight Edge” philosophy of doing the little things over and over. Ultimately reaching your goals and creating change in your life can be a long and challenging process. It’s important to find enjoyment in the process of making small improvements toward reaching your goals and to recognize that you are making a lifestyle change. It is this final piece that can be helpful both in making choices about actions to take and sustaining your goals once you’ve achieved them. Deutschman, A. (2008). Change Or Die: Could you change when change matters most? New York, NY: HarperCollins. Olson, J. (2011). 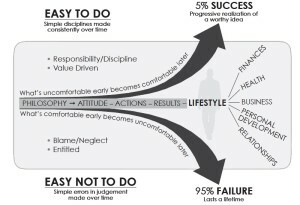 The Slight Edge: Turning Simple Disciplines Into Massive Success. Lake Dallas, TX: SUCCESS Books.